Does the surface finish have iridescence that is an inconsistent “oil slick”, or does it possess a natural, flowing character? Does the face of the tile have striated lines that will make it difficult to clean? Do the backs of the mosaics have an indentation that shows through the tile? Finally, the most important quality is one that cannot be seen by the naked eye. If the glass is not properly cooled (annealed) during manufacturing, it will have a latent stress that can cause cracking or other failures down the road. At Oceanside Glasstile, we do not cut corners or remove steps. We believe beauty and durability go hand-in-hand with the utmost product quality that protects your lasting investment. to support your architectural project. We offer the most dedicated and knowledgeable technical services support in the industry. Our team has developed detailed installation instructions that are backed up with personal guidance for both contractors and homeowners at any stage of the construction process. From the original inspiration to the final installation, Oceanside Glasstile delivers seamless service for a gratifying tile experience as you fulfill your own design dreams. Our products are beginning a new life after serving as things like juice containers, pickle jars and Corona bottles. The glass has been sorted, cleaned and crushed to precise specifications. The recycled glass is combined with raw materials that have been filtered through extensive quality assurance processes. All in all, we are working responsibly to bring you an “up-cycled” product with an absolute commitment to sustainable practices. All Oceanside Glasstile is made primarily from silica sand, an abundant natural resource, with many colors also containing recycled content that may include pre-consumer* and/or post-consumer** recycled bottle glass from curbside recycling programs. 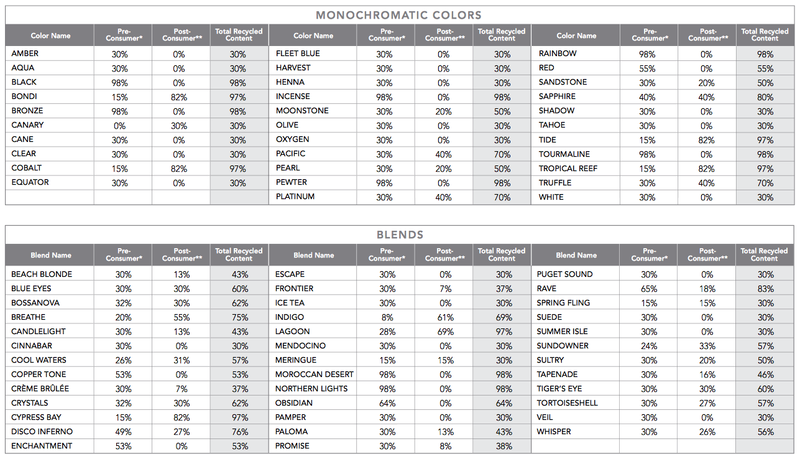 See the chart below for specific content by color. * Pre-consumer materials are generated during our manufacturing process and may consist of scrap and trimmings that were never used in the consumer market. ** Post-consumer material is an end product that has completed its life cycle as a consumer item and would otherwise have been disposed of as a solid waste. Oceanside Glasstile's post-consumer material is recycled bottle glass (cullet) from curbisde recycling programs.